It's purely a coincidence, Sting insisted with a chortle, that he and Peter Gabriel each decided to tour and record this year with full orchestras - two Rock and Roll Hall of Fame inductees doing highbrow symphonic-pop projects at nearly the same time. "Peter Gabriel and I are not tapping each other's phones!" Sting said, his laughter reaching a well-modulated crescendo. "We've both grown in the same kind of creative arc. We're both led by curiosity. And this is the adventure we decided on." A serious man by nature, Sting, 58, laughed even harder when sharing a favorite joke a moment later. "You can't print it in a newspaper," he cautioned, before letting loose with a one-liner profane enough to make even a shock-comic blush. But when it comes to sharing his feelings about the first concert trek of his storied career with an orchestra - the tour stops at Cricket Wireless Amphitheatre in Chula Vista tonight - the English musician born Gordon Matthew Sumner sounded very earnest, erudite and, well, quintessentially Sting-like. "There's this whole universe of music that is simply limitless," he said from Vancouver, where his 40-date North American tour with the London-based Royal Philharmonic Concert Orchestra began on June 2. "When you think you know everything about music, you discover you can't get to the end. I'm on this lifelong journey, and orchestral music is where it's now taken me." Electric guitar great (and fellow Rock and Roll Hall of Fame inductee) Jeff Beck is now on a world tour that features an orchestra on some dates, the better to perform several near-symphonic pieces from his new album, "Emotion and Commotion." 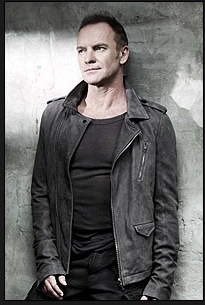 Former Genesis singer Gabriel - like Sting, a veteran solo star of genre-blurring music - recently completed the first leg of his world tour with an orchestra, which resumes this fall. Closer to home, the acclaimed Brooklyn indie-rock band Dirty Projectors and Tijuana electronica group Nortec Collective have both performed concerts with orchestras, while San Diego's Album Leaf last month completed a tour with a string quartet. But none of them has embraced the pop-meets-classical realm with as much relish or success as Sting, who in 2006 topped the classical charts with 'Songs From the Labyrinth', his album of voice and lute music by the 16th-century composer John Dowland. "I've done one-off performances with orchestras at the Grammys and at the Oscars , but I hadn't put a whole evening together with an orchestra until last May in Chicago," Sting noted. "It was important for me that I didn't do the normal thing, where you sing pop ballads and have (classical) musicians 'sawing' along behind you as musical wallpaper. I wanted them to be engaged. The Chicago Symphony enjoyed it, to my surprise, and I did the same thing with the Philadelphia Orchestra. So, once that experiment succeeded, I felt we could take it to rest of country." Sting's tour coincides with his new album, 'Symphonicities', due out July 13 on Deutsche Grammophon, the classical-music world's most prestigious record label. It features "re-imagined" orchestral versions of songs from his solo career ('I Burn for You', 'Why Should I Cry for You?') and his tenure with The Police ('Roxanne', 'Every Little Thing She Does Is Magic'). On both "Symphonicities" and Sting's tour, the Royal Philharmonic Concert Orchestra is conducted by Steven Mercurio (whose previous credits range from jazz great Chick Corea and former Bonsall violin master Mark O'Connor to Luciano Pavarotti and the San Diego Symphony). Mercurio is one of nine arrangers featured on the album. With Sting essentially offering his fans familiar music in a fresh setting, cynics might say he's simply treading water, creatively speaking. But the pragmatic performer believes his tour and new album allow him to experiment, without going too far afield. "I'm not treading water," he said "If I presented a program of new music with an orchestra, it would be very daunting for audiences to deal with. To give them something they partially recognize, and then alter it, gives them a different point of view. It's not exploring new water as much as a different part of the musical river. "Sometimes to move forward, you need to go back and re-explore something, and then go forward. If anything, this experience will encourage me to write new material for this (orchestral) format. But I needed to experiment with my old music first." The rock-meets-classical marriage ignited in 1967 with The Beatles' landmark 'Sgt. Pepper's Lonely Hearts Club Band' (an album so influential it later inspired the formation of the band the Electric Light Orchestra). In the late-1960s and early '70s, artists as varied as former San Diegan Frank Zappa and such English bands as The Moody Blues, The Nice and Procol Harum recorded and performed with orchestras. "Back then, it was highly experimental and almost dangerous to move the 'hippies' into the academic and more specialized world of an orchestra," recalled former Deep Purple organist and composer Jon Lord , whose live 'Concerto for Group and Orchestra' album in 1969 teamed his band with the Royal Philharmonic Orchestra. He left rock behind more than a decade ago to focus on composing and recording classical music, including his new album, 'To Notice Such Things', a six-movement suite with the Royal Liverpool Philharmonic Orchestra. "What I now see," Lord observed, "is that it has become almost de rigueur - a rite of passage - for rock acts to 'go classical.' At some point, you think: 'Let's get the old symphony orchestra in and that'll look good.' It doesn't always come off, though, because it's been done more for visual, and maybe career reasons, than musical reasons." Today, everyone from Metallica to Paul McCartney has performed a concert or two with an orchestra. But the cost of mounting an orchestral tour, especially at a time of global recession, is substantial. Rather than take the less expensive option of hiring musicians from local orchestras in each city to back him, Sting is doing his entire tour with Mercurio and the 45-piece Royal Philharmonic Concert Orchestra. They will be augmented at each concert by Sting's longtime guitarist, Dominic Miller, veteran jazz bassist Ira Coleman, vocalist Jo Lawry and Bang On A Can All-Stars percussionist David Cossin. With 40 songs rehearsed and polished - 12 more than they'll perform each night - Sting and his 50 supporting musicians will be able to change their repertoire from show to show. "We really are trying to do something good here," said the classically trained Miller. "We've invested a lot of time and quite a lot of money, to the point of doing five or six arrangements of some of Sting's songs until they sounded right. It's not a matter of him just playing his hits with an orchestra, which is shallow. "In the 1970s it was a novelty for rock stars to work with an orchestra, but not now. We're very sensitive about the harmonic textures and about how what we do compliments what the orchestra does, and vice versa. Sting has put his whole being into this." Even so, mounting an orchestral tour in what is fast shaping up to be a very trying summer for the concert industry could be risky. "I am a gambler and I think I've always been rewarded for my risk-taking," Sting said. "My ambition is to be allowed to do anything that I want to do again, and to reach a standard where people will at least say: 'That was OK.' I think the whole idea of being successful' in music is to have a unique signature or sonic fingerprint, and - no matter what context you sing in - people recognize it as you. Whether they like it is another matter." "At his apartment on Central Park West, Sting explains that the idea of exploring his catalogue came in 2008, when he was invited to perform with the Chicago Symphony Orchestra. "Hearing my music interpreted in that very lush, dramatic fashion was very powerful," he says. "It felt like being tied to the front of a train..."